New paper argues that colleges can’t afford to improve the pay and working conditions of those off the tenure track. Activists slam the analysis. According to the authors’ rough calculations, institutions across academe currently employ 752,669 adjuncts to teach 1,578,336 courses annually, costing about $4.3 billion. Per-course pay in that estimate is $2,700 — a commonly cited national average. To illustrate their point, Brennan and Magness put together a “minimally good job” package, including a $50,000 salary (teaching six courses per year), plus benefits and office space, that would cost a university $72,000 annually. To replace these 752,669 adjuncts with 263,056 minimally good jobs would cost universities $18.9 billion, they say — nearly $15 billion more each year. If that doesn’t sound like much of an increase, the authors argue, that’s just base costs, without merit raises that could be earned in subsequent years or other perks. To replace those minimally good jobs with something even better — 75 percent of the average tenured full professor’s pay of $122,000 — the cost would be about $32 billion a year. The paper references Service Employees International Union’s aspirational proposal that adjuncts be paid $15,000 per course (including benefits), estimating that would cost universities $19 billion more annually. Putting the estimated cost increases into perspective, the authors say it’s “far from obvious” whether universities would be able to afford such a change. According to U.S. Department of Education data from 2013, public and private colleges and universities spent $477 billion on all expenses. About $139 billion went to instruction, with about $100 billion spent on faculty salary, wages and benefits. Making the proposed pay adjustments would mean increasing that figure by 15 to 50 percent — some $15-50 billion — the authors say. Unsurprisingly, adjunct activists found much to criticize. He said the paper seemed to be “deflecting” some important issues, including by focusing too much on the $15,000 SEIU proposal, which some have said is too ambitious. Brennan acknowledged that his institution hadn’t opposed an adjunct faculty union affiliated with SEIU (even though some of its Jesuit peers have objected to such drives on religious grounds), and that Georgetown adjuncts — who already received relatively high pay — have seen modest pay increases under their contract that haven’t thrown the campus into financial straits or resulted in mass job losses. Adrianna Kezar, professor of higher education and director of the Delphi Project on the Changing Faculty and Student Success at the University of Southern California, said the paper nevertheless lacks the impact and “nuance” it’s trying to achieve. The cost calculations are notable to some degree, she said via email, but lack any consideration of university budgets beyond current instructional costs. Another faulty assumption, Kezar said, is that there’s a one-size-fits-all answer of paying all adjuncts equally — something higher education has never done. A better proposal would be for full- or nearly full-time, “mainline,” instructors to earn more as institutions move back to a “true” adjunct model, under which working professionals who teach a class on the side (about 15-20 percent of the faculty) could have a different pay structure. Beyond the numbers, the paper is a flawed “set of ideological arguments — mostly trying to persuade readers that even beyond cost there is no logical reasoning to make such a redirection of funds,” Kezar said. For example, she said, having more core faculty members teaching introductory courses is actually a good thing, in terms of student success, and her research suggests deans want to see these instructors teaching more lower-level courses and adjuncts teaching more specialized, upper-level courses. The paper’s one “legitimate” argument might be that class sizes would increase to rectify the pay issue, but classes are generally already “very large,” she said. Certain majors can often beg the question, “What do you plan to do with that?” A valid question, given that college graduates are now leaving school with an average of $35,000 in student loan debt. Being saddled with a financial burden that large can make it hard to move forward with other goals. In a Gallup survey, one in four people said they pushed back their timeline for important post-grad milestones like buying a house, a car, or starting a family. 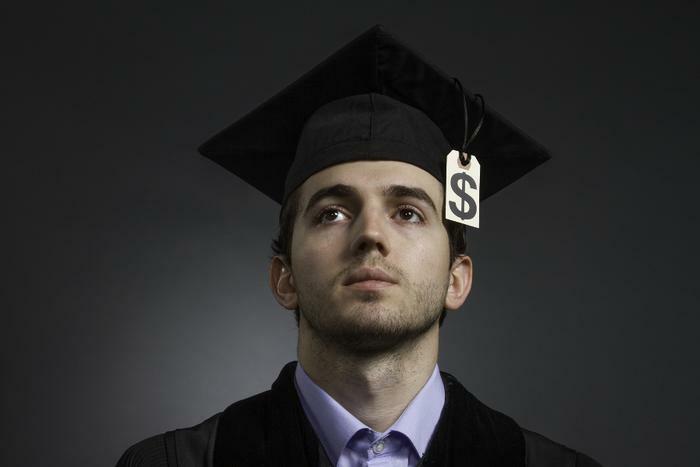 Nineteen percent even said their student debt burden was an obstacle to getting married. To avoid having to delay these important post-grad milestones, it’s crucial to take into account how your major can influence your attractiveness to lenders. So what exactly do lenders consider before deeming an individual financially healthy enough to borrow money? According to a report released recently by Credible, debt-to-income (DTI) ratio is a huge factor in determining if an individual is financially healthy enough to be given a loan. And when judging a person’s ability to repay a loan, the lower the DTI the better. “A person’s DTI can be a yes/no factor for a lender, regardless of the person’s job history,” Credible’s chief executive officer, Stephen Dash tells Bloomberg Business. A DTI of 36% or lower is the “sweet spot,” according to the National Foundation for Credit Counseling (NFCC). To find the DTI for different majors, Credible looked at the debt load and college major of students in its study sample and added in their estimated car, rent, and credit card payments. It divided its estimates of monthly debt payments into the average monthly income numbers for each degree type. And in what may or may not come as a surprise, psychology doesn’t rank too high on the “creditworthy” graduates list. College graduates who studied medicine were in the best shape, financially, to pay back their student loans — much better than those who studied psychology, says Credible. Degrees in pharmacy, dentistry, and post-graduate medicine had the lowest DTI ratios, the report showed. More than any other majors, these students go on to land salaries that are high enough to offset their student debt, making them loan-worthy. The majors that made it the hardest to pay back debt include history, education, and psychology. However, if students attend graduate school for one of those subjects, they’ll be able to shift their salary-to-debt ratio more in their favor, thus lowering their DTI ratio says Dash. “Student loan debt is about $1.2 trillion and growing, with not everyone who took out students loans able to pay them back. Student loan default rates doubled between 2000 and 2011, according to Brookings Institution researchers who analyzed U.S. Department of Education administrative data on federal student borrowing, linked to earnings records derived from tax records. Their report traces most student loan defaults to students who attended for-profit colleges and, to a lesser extent, community colleges. A common thread, the researchers found, was non-traditional students – typically older than the average student – and those attending “non-selective” institutions – schools that accept anyone – were most likely to default. “These non-traditional borrowers were drawn from lower income families, attended institutions with relatively weak educational outcomes, and experienced poor labor market outcomes after leaving school,” the authors write. At the same time, the authors contend students attending traditional public or private non-profit colleges were much less likely to default and have done better in the job market after graduation. The finding that a significant portion of student loan defaults occurs among students attending for-profit schools is not exactly a new charge. Federal data released last year showed nearly half of the 650,000 federal student loan defaults between 2011 and 2013 were by students at for-profit schools. The Brookings study appears to suggest students who are not qualified to attend college – they choose schools that have no admission requirements – are the ones who take on too much debt and default. The authors say a relatively new development is community college students are defaulting on student loans. In the past, the report says, few of these students took out loans to pay for college. According to the report, the borrowers from those 13 schools owed about $109 billion—almost 10% of all federal student loans. And once out of school, they faced more difficult employment prospects. For example, the researchers say the median borrower from a for-profit institution who left school in 2011 and found a job in 2013 earned about $20,900 a year. At the same time, 21% were unemployed. 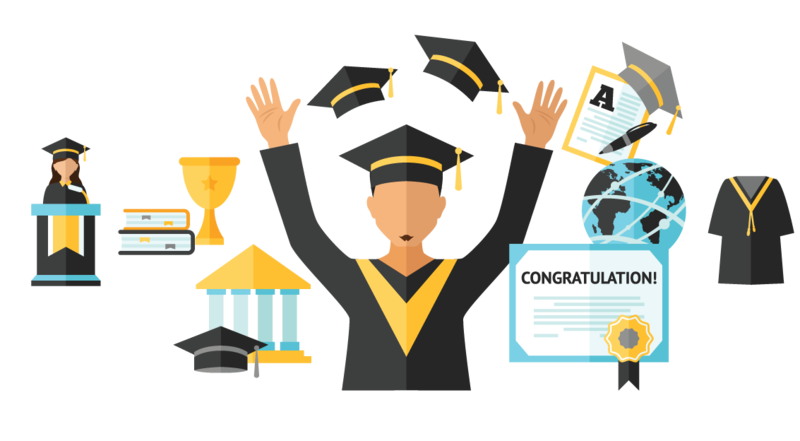 Will your college major land you a job after graduation? “College freshmen, who are settling in on campus this week, probably arrived at school having already settled on a major. However, they might want to read this before finally making up their minds. The workplace has its own needs and it turns out that colleges aren’t supplying as many graduates to fill those slots. In some cases, they might be providing too many in other less-in-demand fields. Researchers at Economic Modeling Specialists International (EMSI), working in association with employment site Careerbuilder.com, looked at post-recession trends in education and compared them with trends in hiring. “The market is at a unique inflection point, and we need to make sure that we’re educating workers to have 21st century skills for 21st century jobs,” said Matt Ferguson, CEO of CareerBuilder. The study uncovered a positive development. After years of promoting science, technology, engineering, and math (STEM) disciplines, colleges are turning out more students with STEM degrees. But the survey also showed a slowdown in overall degree completions – especially those tied to developing strong communications and critical-thinking skills – and Ferguson says that’s concerning. So which degrees are most in demand? The study found more than half of the top 10 broad programs leading the U.S. in degree completion from 2010 through 2014 were in STEM fields. There was a 49% growth in demand for degrees in science technologies. There was a 45% increase in demand for degrees in natural resources and conservation. Demand for graduates with a background in parks, recreation, leisure, and fitness was up 44%, exceeding demand for experts in math and statistics, which rose just 35%. There was also strong hiring demand for graduates with backgrounds in law enforcement and engineering. The study found most of this growing demand occurred during the most recent year. If you happen to be majoring in one of these areas, you might have multiple job offers after graduation. If you are majoring in the humanities, job prospects might not be as bright. From 2010 to 2014, the study found only nine broad program categories experienced decline, nearly all of which were in humanities and social sciences. Demand for applied science degrees were down 30%. There was a 17% drop in demand for library science degrees. Of course, business needs often change and can do so relatively quickly. What’s hot today may not be in demand tomorrow. The study found that culinary services demand grew from 2010 to 2013, then declined after that. The same is true for law degrees. UW-Madison student Kezia Weigel-Sterr was at University Book Store on the State Street Mall Wednesday to pick up the only text for the fall semester she was not able to rent online from a bookseller or publisher. Her total textbook price tag: $286 — a lot less than the $400 or so she has paid in past semesters. As a political science major, the books her instructors assign are not typically the big wallet busters used in some classes, particularly the sciences, but some courses require a lot of texts. “There was one class last semester that had eight different books,” said Weigel-Sterr, who will be a sophomore in September. She rented all those books and for another class used a reserve copy of the text at a university library instead of purchasing it. “Nobody else was looking at it, but I could only have it out for two hours at a time,” she said. For another course, her professor, Donald Downs, gave students a book he had written that was used as the text, Weigel-Sterr said. Her story illustrates how college students are increasingly staying away from buying textbooks as a way to keep their spending down as the sticker price for books continue to soar, along with other college costs. Textbook prices have climbed some 1,000 percent over the past four decades, according to the U.S. Bureau of Labor Statistics, with some titles now costing $400 or even $500. But students have been spending less on course materials in each of the past few years, according to a survey of the National Association of College Stores. Students’ average annual spending on course materials dropped from $701 in 2007-2008 to $563 in 2014-15, according to the association. The inclusion of non-renewable computer codes needed to access supplementary materials has driven up the price of some texts and obstructed the used-book market, said Patrick McGowan, president of University Book Store. But student expenditures are nevertheless dropping because fewer books are being required as course materials, he said. On the UW-Madison campus, instructors are increasingly using open educational material — notes, articles, and databases that either are available free on the internet or for which the university has purchased access, McGowan said. About 40 percent of courses being offered on campus this fall have no required books, he said. That’s one reason that the most frequent visitors to the lower level of the book store — where the stacks of textbooks are located — were people in search of the public restroom on a recent weekday afternoon. The other reason is that online registration for classes means that the crush to register and buy texts right before the start of the semester is a thing of the past. Students now have plenty of time to shop for the best price on their books and plenty of websites on which to do it. For University Book Store it means that revenue from textbook sales is dropping “from the mid to high single digits” every year, said McGowan. But textbook sales and rentals still account for about half the revenue at the store, where the main floor focuses on the sale of Bucky Badger apparel and other items. For many years, the university libraries did not purchase textbooks, but that has changed in the past decade, said university librarian Edward Van Gemert. “Our observation is that more and more students are forgoing purchasing print textbooks,“ Van Gemert said. They may find ways to share the cost, and often postpone getting a textbook until it is clear it is actually required for a course, he said. So the library has stepped in to provide access to some textbooks. For example, in 2013-14, the library spent $25,279 to purchase 538 course-related books and videos. A separate “high-cost textbook” fund of $4,000-$5000 a year buys multiple copies of particularly expensive books used in high-enrollment classes that are held on reserve at multiple libraries for two-hour loan. Many instructors are helping students reduce course material expenses by seeking out open educational resources, said professor Kristopher Olds, chairman of the department of geography and a senior fellow in educational innovation. Those materials — texts, podcasts, videos and other visualizations — are designed to be available digitally at low or no cost, Olds said. UW-Madison is trying to get a handle on the development and use of such resources on campus, and will soon launch a study, he said. The interest in open resources is spurred by an appreciation of the high cost of curriculum materials, a culture that says knowledge should be shared and technological innovation that facilitates sharing, Olds said. Research also shows that ready access to curriculum materials, without obstacles of cost, enhances student engagement and outcomes, he said. 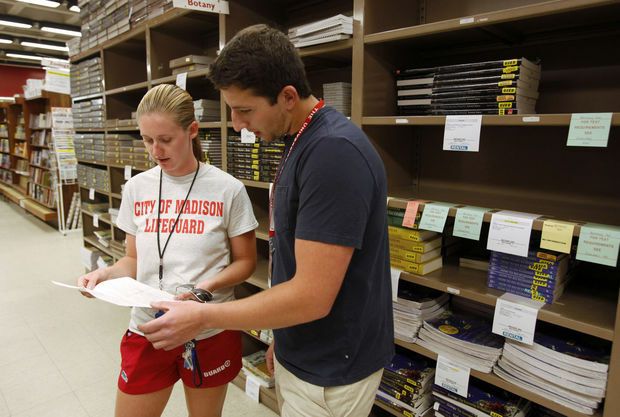 Instructors are sensitive to the cost of the materials they assign, said Alex Chase, a UW-Madison senior who works at the book store. “Working here, I’ve been able to see that it’s a thin line they walk between giving students the best and latest information and the price,” said Chase, who is majoring in legal studies and political science and plans to go to law school. And students network about how to keep the price of books down, said student Mariel Leering, also a book store employee. She said everyone routinely shops websites like Amazon and Chegg for the best prices. Leering, a junior, is studying genetics, a field where textbook prices can be high. But a friend is lending her a $150 textbook for one class this coming semester, leaving her to purchase only one $120 text and a couple of course packets of materials collected by the instructor. Leering figures her course material expenses will total $150. “For once, I’m not spending $400,” she said. Not that she’d actually be paying that full $400. Her grandfather frequently buys some of her books and she has had a college fund since she was a child, Leering said. “A proposal to merge University of Wisconsin System colleges with the state technical college system — on top of a plan to regionalize the UW colleges — threatens to slam the door to education for Wisconsin students who need it most, said UW-Marshfield/Wood County associate professor Kelly Wilz. The contraction of the two-year school system through cuts in state funding to the UW System is sparking an exodus among the skilled and dedicated instructors who are her colleagues, Wilz wrote on her blog, Dissent and Cookies, in a post picked up by The Academe Blog of the American Association of University Professors. “The UW Colleges literally embody the Wisconsin Idea — the idea that everyone should have access to affordable, quality education. And now we’re losing our best,” wrote Wilz, who teaches communications and theatre arts. The “best” faculty at UW-Marshfield, said Wilz, are those who go the extra mile to help their students — part-time, returning and first-generation — succeed. “Why? Because that’s what you do … when you believe in students who have never been told they’re worthy. That they matter. That it doesn’t matter if they are the first ones in their families to go to college because we’re here to help them navigate those waters,” Wilz wrote. She joined the chorus of critics who point to departing colleagues as a sign of the UW’s decline. 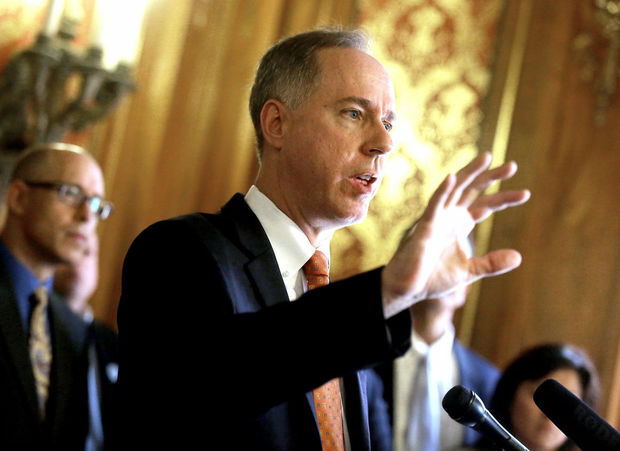 “UW-Madison faculty urged Assembly Speaker Robin Vos to open up talks on the possibility of merging the University of Wisconsin System and the Wisconsin Technical College System. Their request came in the form of a letter from PROFS, a faculty advocacy organization, delivered Wednesday. Legislators should instead “create a transparent and inclusive process for any review of public higher education in the state,” faculty said in letter signed by the 18-member steering committee of PROFS. They pointed to the controversial, abandoned plans to create a public authority for UW-Madison in 2011 and the entire UW System earlier this year as proof that “closed-door negotiations” on plans to restructure higher education in Wisconsin don’t succeed. A better model is the public debate that preceded the 1971 merger of the University of Wisconsin and Wisconsin State University system, they argue. “It’s difficult. You are not guaranteed work, so you are livving under the fear of not having work.” — Michael McDaniel, a part-time instructor at MATC. Michael McDaniel wrote “What was your first job?” on the board of a classroom at Madison Area Technical College. His students responded with brief accounts of their experiences, setting the stage for reading a story about a first job in “The House on Mango Street” by Sandra Cisneros. Friendly and funny, McDaniel worked to help the 10 students identify themes in the coming of age novel about an immigrant girl in Chicago: the scary journey from home into the broader world, the tensions of differing expectations and their clash with reality. Student Israel Ortiz, a native of Mexico, said he sought out the class after taking an online course with McDaniel. “I figured it would be interesting to see Latino literature from a U.S. approach, but it was because he was a good teacher more than anything,” Ortiz said. He always has thought of McDaniel as “professor,” Ortiz said, and was surprised to learn that McDaniel is a part-time instructor who does not know from one semester to the next which classes, if any, he will be teaching. McDaniel earns less than $8,000 a semester teaching a three-course load, considered full time in academia. “When you see the amount of time he puts into it …” Ortiz trailed off before adding that at least one other teacher at MATC had talked about his part-time status. “They are giving full efforts, and not being compensated for it,” Ortiz said. That’s the sentiment among many of the thousand-plus adjunct instructors who teach thousands of students in Madison, at MATC, the University of Wisconsin-Madison and Edgewood College. The circumstances of these adjunct instructors differ from institution to institution. They may struggle to paste together a sufficient workload to make ends meet, teaching at multiple local institutions. Others earn a comfortable wage, but bristle at the better pay and greater job security given tenured faculty doing similar work. Some profess appreciation at being given the opportunity to bring their professional experience to the college classroom. All say they love to teach. The public’s idea of college instructors’ work lives is dramatically different from the reality, at technical colleges, private colleges and public research universities alike, says Mike Kent, a part-time lecturer at MATC since 2005 and president of the MATC Part-time Teachers’ Union. “You’re much more likely to receive a course from a teaching assistant or someone hired as part-time instructor – who may not have a desk or a phone number – than you are to have a ‘professor,’” Kent said in his union’s cramped office at MATC’s Truax campus on the city’s east side. Part-time instructors were teaching half the courses at MATC during a spike in enrollment in 2010-2011, as adults scrambled to re-train after layoffs during the Great Recession, but today teach 30 to 40 percent of classes, Kent said. That rate is reaching 80 percent at some institutions across the higher education spectrum, he said. In 2013, 46.7 percent of teachers at four-year and two-year higher education institutions across the country were part-time instructional staff, and 14.3 percent were full-time, non-tenure track instructors, according to statistics compiled by the American Association of University Professors. The percentage of instructors greeting college students that year who were tenured professors or on track to become one was 20.4 percent, down from 45.1 percent in 1975. At MATC, part-time teachers are paid a median $2,600 per three-credit semester class and get no health insurance coverage, Kent said. Full-time instructors, by comparison, earn an average of $92,000 a year, get health insurance and are members of the Wisconsin Retirement System, he said. Adjunct faculty are not given any assurances about which courses they will teach and may get three daytime courses one semester, one evening course the next and none the following semester, Kent said. This unpredictability makes it hard to find and keep other employment to supplement income, he said. It also means high turnover, with about one-third of part-timers leaving every year, Kent said. And that means a succession of first-time teachers, which erodes the quality of instruction, he said. For example, Kent taught business statistics for the first time this semester. He spent a lot of time developing the curriculum, he said, but not as much time as he would if he knew he would be teaching the course over a long period of time. And if Kent never teaches business statistics again, he and his students won’t get the benefit of content curated and approaches tested over time. McDaniel said turnover among instructors discourages student retention because a connection with a supportive instructor helps students stay in school, especially at schools like MATC. He shares an office with other part-time instructors, he said, so often holds critical one-on-one sessions with students in the cafeteria or other common spaces scattered through MATC’s massive main building. Michael McDaniel, a part-time instructor at MATC, teaches a U.S. Latino literature class at the college. Teaching at MATC is challenging because the college’s policy of open enrollment results in classes that typically include students with a broad range of abilities. “Many are working a full-time job in addition to trying to be a full-time student, and all the socioeconomic issues plaguing the working class in the United States show up in the classroom,” McDaniel said. So, instruction must be tailored to students’ varied abilities, and interaction adapted to their multiple time constraints. Since most of his students say they want to transfer to four-year institutions, McDaniel says he tries to prepare them to survive and learn. McDaniel taught three courses at MATC this past semester and hopes he will get three courses in the fall, but he can never be sure. He also will teach a single course this summer. He estimates he works 60 hours a week for the three courses he is teaching, plus an additional 20 to 30 hours a week for additional functions at the college, in the writing center and as a facilitator for an internal problem solving program. McDaniel, 49, got a master’s degree from Cornell University and completed all but the dissertation towards a Ph.D. in the English department, American Indian Program. He taught in the California state university and community college systems and at the Indian Community School of Milwaukee. He started teaching American Indian literature and English composition at MATC three years ago, and has since added U.S. Latino Literature. To earn more money, he taught a course for the first time this past semester at the UW-Madison’s Wisconsin School of Business, where he was paid more than twice MATC’s course rate. Although he has not applied for public aid other than subsidies for health care under the Affordable Care Act, McDaniel said he was eligible for food stamps until he got the contract to teach at UW-Madison and would become eligible again if he loses work at either institution. “Any individual working as an adjunct must learn to live with economic insecurity,” he said. McDaniel said he would like to dedicate all his time to students at MATC, but “unfortunately, due to economic conditions and institutional inertia, I must navigate the market forces of higher education,” he said. The market forces of higher education have pushed compensation for adjunct college instructors so low that they are a target for SEIU, a national labor union best known of late for its “Fight for $15” campaign among fast food workers that seeks to raise pay to $15 an hour. The campaign among adjuncts has set a goal of $15,000 per academic course taught. That’s an aspirational goal as much as a practical one, activists say. But they hope it ignites a conversation about how much money spent at colleges is spent on classroom instruction. MATC’s part-time teacher’s union, Local 6100 of the American Federation of Teachers-Wisconsin, has re-certified twice since the 2011 enactment of Gov. Scott Walker’s Act 10, which gutted the power of public employee unions. Collective bargaining for public employees now is restricted under state law to increases in pay tied to inflation, but Kent said he is hopeful of improving conditions under a shared governance model introduced by Jack Daniels, who became MATC president in 2013. Daniels said compensation – pay and working conditions – is the focus of shared governance councils that will develop proposals to be brought to him for his recommendation to the college’s board of trustees. The college, meanwhile, has been cutting expenses to avoid a shortfall in its operating budget for next year. 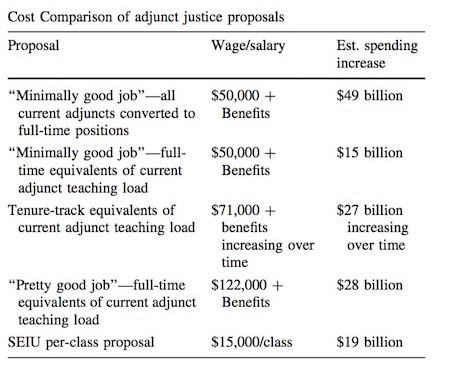 He was not hopeful about offering adjuncts guarantees in what courses they will teach. One change might be in the way part-time and full-time statuses are defined, he said. The number of instructional staff, as opposed to faculty, has risen sharply at UW-Madison over the past 25 years, mirroring a national trend. Today there are nearly as many instructional academic staff teaching students as there are faculty members, not to mention the graduate student teaching assistants who work with faculty and can be an undergraduate’s closest point of contact. In 2014, there were 1,762 instructional academic staff at UW-Madison, compared to 2,085 faculty members, according to UW-Madison’s office of Academic Planning and Institutional Research. Instructional staff was up 20 percent from a decade ago and more than 160 percent from 25 years ago. The number of faculty in contrast, has dropped by just over 5 percent since 1989, inching up some 1.5 percent in the last decade. The university also employs many additional academic staff who conduct research, perform administrative tasks and fulfill functions other than course instruction under a variety of titles. Hiring academic staff instead of faculty is a way to keep costs down, said Scott Mellor, a distinguished lecturer in Scandinavian studies. “We are cheaper than faculty, and that can be a problem,” he said. Mellor holds the highest rank in UW-Madison’s complicated system of instructional staff classifications. His job carries a salary that, at minimum, must be 85 percent of a professor’s minimum salary under university policy, he said. 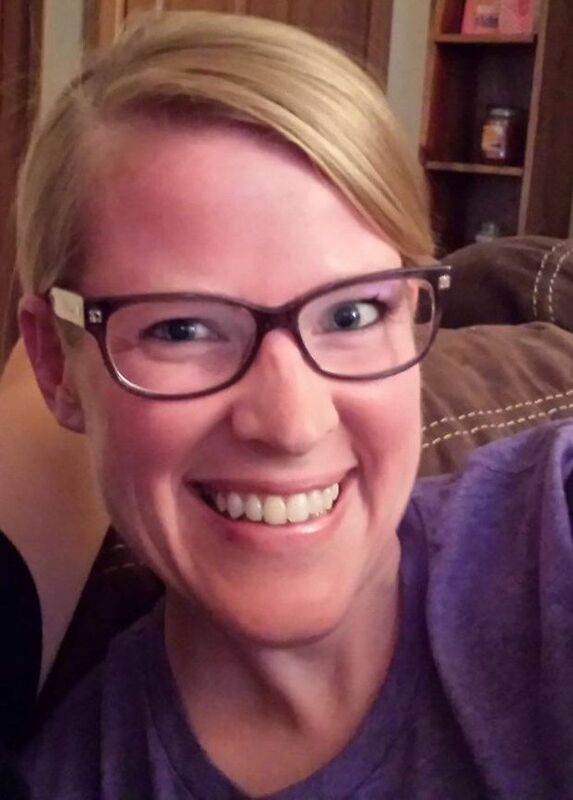 Mellor has a Ph.D. from UW-Madison in advanced folklore studies and has taught as a lecturer there since 1999. He worked his way up through the levels of lecturer and senior lecturer and was made distinguished lecturer in 2009 in a merit selection process that looks a lot like what is required to get tenure, he said. Instructional staff start work at the university with no job security, and may be hired to teach a course on a semester-to-semester basis. Campus policy prohibits staff from teaching in the same department for more than three successive years on that basis, however. Many staff members then are contracted to work on a fixed-term renewable basis. Some get “rolling horizon” appointments that run one, two or three years and require prescribed periods of notice if they are not renewed. Mellor started on a staff, rather than faculty, track because his spouse was a faculty member and the university had not yet developed its policy of accommodating employment of two-faculty couples, he said. And educational backgrounds between instructional staff and faculty are typically very similar, he said. Instructional staff are not required to conduct research, as tenured faculty are, he said. Some do, however. His online resume lists books, articles, conference presentations and invited lectures, yet after 16 years on staff he earns a few thousand more than the $50,736 minimum for academic staff of his rank. That is a common circumstance for instructional staff, but faculty don’t linger so near the bottom of the pay range, he said. “The average lecturer in my department makes $55,000, and the average professor is closer to $90, 000,” Mellor said. Full-time instructional staff at UW-Madison get the same health care and pension benefits as faculty. The relationship between faculty and academic staff varies among departments, Mellor said, but it is quite collegial in his, with academic staff having a voice in many departmental policy deliberations. Mellor is concerned, however, that as the number of instructional staff rises on campus, he has begun to hear complaints about being underpaid. “I see how that is a problem keeping talented people, and it concerns me deeply,” he said. An instructional staff member in languages at UW-Madison, who did not want to be identified, said she is facing stalled pay increases and that staff is not well respected or consulted on major decisions in her department. Staff are treated as lower-class citizens, she said. Faculty get preference in course assignments, including summer school, a potential source of extra income, she said. She would move on to another institution, but the job market is bad in her field, she said, and starting on a tenure track now would mean a cut in pay for several years. A lecturer in the College of Letters and Science said he was grateful to professors for helping him get a job at UW, but that pay for lower-ranked teaching staff is “exploitative.” Lecturers by policy must be paid 75 percent of a tenure-track instructor of the same level, but many have less than full-time appointments, which sharply cuts their earnings. Mellor credited Chancellor Rebecca Blank with using a “critical compensation fund” to fill some of the more obvious pay gaps, but some $90 million cuts looming for the campus in Gov. Scott Walker’s budget next year likely will make further progress there impossible, he said. Staff members, under the terms of their employment, are much more vulnerable to layoffs, he said. “But when you look at the economic reality of the country, there are a lot of people a lot worse off,” he said. And Mellor is hopeful policy changes to improve the lot of university staff can be made under a new human resources system, independent from the state’s system, that goes into effect on July 1. 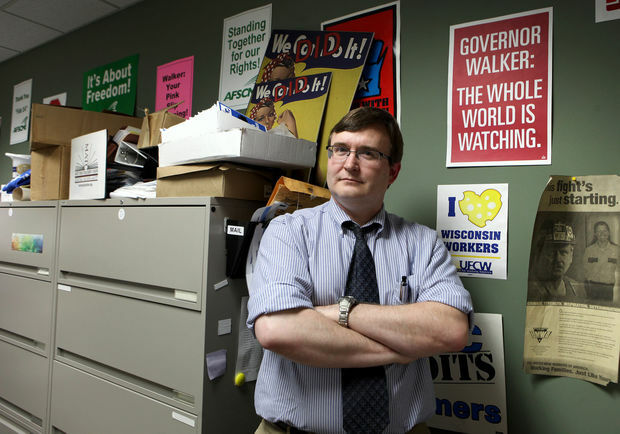 Karl Scholz, dean of the College of Letters and Science, said UW-Madison doesn’t exploit its staff. “In the higher education press, you see all sorts of articles about the exploitative relationships between folks poorly compensated teaching and universities and colleges leveraging that to cut corners. I don’t think that happens at UW-Madison and I don’t think it will happen for the foreseeable future,” he said. The phenomenon in urban areas where a Ph.D. strings together four or five jobs at different universities is not a model that characterizes the commitment to providing a high quality education that guides his college, he said. “I don’t think stringing together jobs to make ends meet is good for the person or good for the students,” he said. What’s more, the Madison area doesn’t have enough higher education institutions to make that scenario likely, he said. Scholz said his college is working hard to mitigate the impact of coming budget cuts. “I hope to avoid layoffs, and instead eliminate positions by not hiring to fill vacancies on both the staff and faculty sides,” he said. As of May 5, 92 vacant positions were cut in Letters and Science, including 48 faculty members and 18 academic staff. No layoffs had been scheduled. Shad Wenzlaff was a traveling adjunct who focused on a single employer a few years ago to ease stress in his work life. Wenzlaff had stopped work on a Ph.D. in art history at UW-Madison without completing his dissertation because he could no longer live on a teaching assistant’s stipend, he said. The decision not to complete his Ph.D. slammed some doors. “I ended up being an adjunct who just floats,” Wenzlaff said. He taught classes at several colleges in the region – three in a single semester at one point – until he decided he could no longer juggle courses, students and policies. Wenzlaff now teaches art history only at Edgewood College, where he also directs student research part time. The teaching and administrative functions together make him a full-time staff member and eligible for benefits. Edgewood is a private, Catholic liberal arts college founded by Dominican sisters that espouses values like justice, compassion and community as part of its mission. “Our values call us to do a number of things, and I think that is the basis of some of the things we have been doing the last few years” to improve conditions for adjunct faculty, said Dean Pribbenow, vice president for academic affairs at the college. Edgewood has about 300 instructors, with just over 100 full-time tenure-track faculty, Pribbenow said. The number of part-time faculty varies, but in the fall 2014 semester, the college employed about 170 part-time adjunct faculty, he said. Part-time faculty are used to teach some of the multiple sections of basic courses, but also to provide special expertise, especially in the college’s professional schools, Pribbenow said. On rare occasion, a “community lecturer” may be paired with an instructor of record to share their unique life experience, he said. Pribbenow would not say how much adjuncts are paid, but said improving the experience of part-time instructors has been the focus of faculty committees. Over the past several years, the college has moved part-time faculty toward full-time teaching loads when possible and worked to promote them to more highly paid lecturer positions, he said. Wenzlaff said that as a senior lecturer, he has health insurance and retirement benefits and works in a positive culture. Wenzlaff supplements his income by teaching piano in his private studio. He enjoys being able to engage both his art and music talents, “but I wish I didn’t have to work so much,” he said. Percy Brown, director of equity and student achievement for the Middleton Area School District, was an adjunct instructor for the first time this year in the School of Education at Edgewood, where he also is pursuing his doctoral degree. The students in one class last fall were all international students from Saudi Arabia, but those in other classes were nearly all white, Brown said. As the students train to teach in public schools where students are increasingly racially diverse, the college would do a disservice to them if it did not prepare them to meet the needs of those students, he said. Brown comes from a family committed to social justice and that is a guiding influence in his life, so the compensation for teaching a college course or two goes beyond money and professional development, he said. “I’m grateful to Edgewood College for calling on me,” Brown said.